The product of an exhaustive, years-long, worldwide research project, Early Years tells the riveting story of the early life of the man who, as much as anyone else, set the course of Jewish history in the twentieth century. What was his childhood like? What type of schooling did he receive? Who were his mentors and teachers? When did he first meet his father-in-law and predecessor, and what was the relationship between them like? At what point did the ideas that were to transform the landscape of post-Holocaust Jewry begin to take form in his mind? These questions and others about the Rebbe's early life have never been answered comprehensively. Presenting newly-uncovered government documents, private journals, letters and diaries, Rabbis Boruch Oberlander and Elkanah Shmotkin have produced a highly-engaging account which offers an unimpeded view of the formative years of modern Judaism's most recognized personality. Over 450 documents and photographs are beautifully reproduced in full color, illuminating and informing the text. 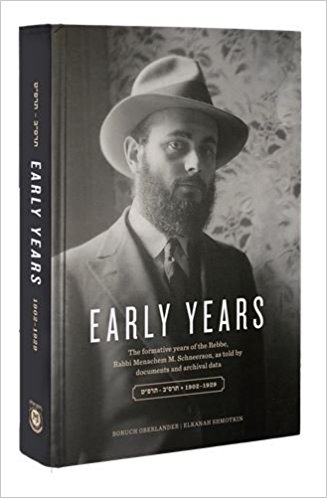 Meticulously researched and engagingly presented, Early Years tells the fascinating story of the Rebbe's early life, including newly-uncovered details of: The Rebbe's first meeting with his future father-in-law, Rabbi Yosef Yitzchak Schneersohn of Lubavitch. How the match between the Rebbe and Rabbi Yosef Yitzchak's middle daughter, Rebbetzin Chaya Mushka, came about. The identity of the Rebbe's childhood teacher who lived in his home and whom he described as "a great Torah scholar." The details of the Rebbe and the Rebbetzin's wedding in Warsaw, and of the simultaneous celebrations across the globe marking the event. The Rebbe's life in Berlin, where he lived with Rebbetzin Chaya Mushka, hundreds of miles from his father-inlaw and the seat of the Chabad-Lubavitch movement..